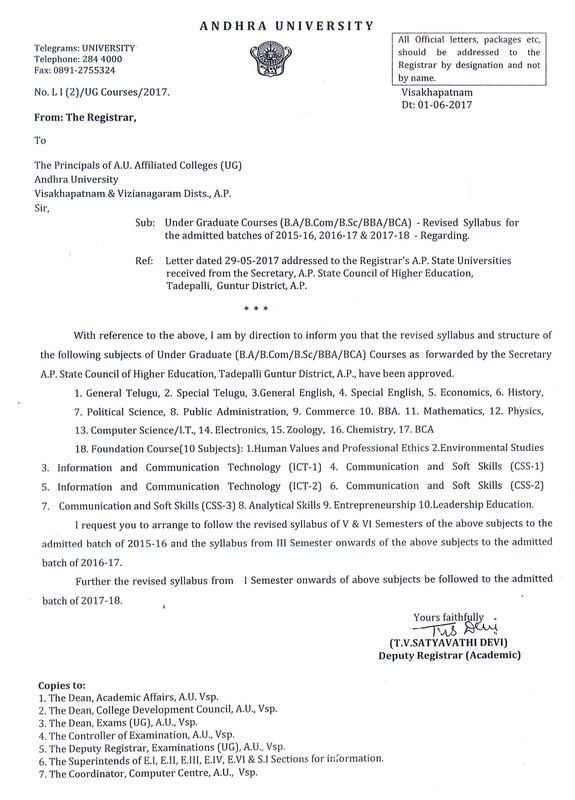 01/06/2017 :: Under Graduate Courses - Revised Syllabus Letter. 1. UG CBCS Guidelines All State Universities May-2016. 4. Revised Syllabi of Foundation Courses CBCS for all Degree (April-2016). 5. 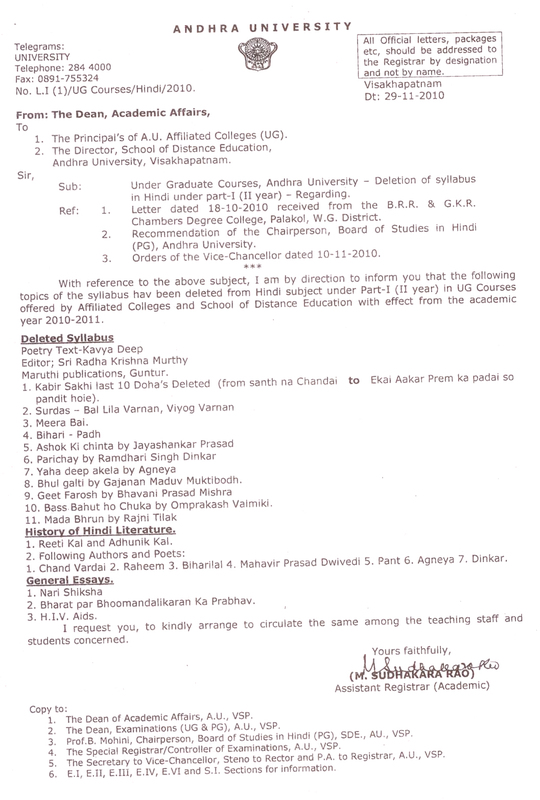 General Telugu Syllabus CBCS for all Degree prog 2015-2016. 6. 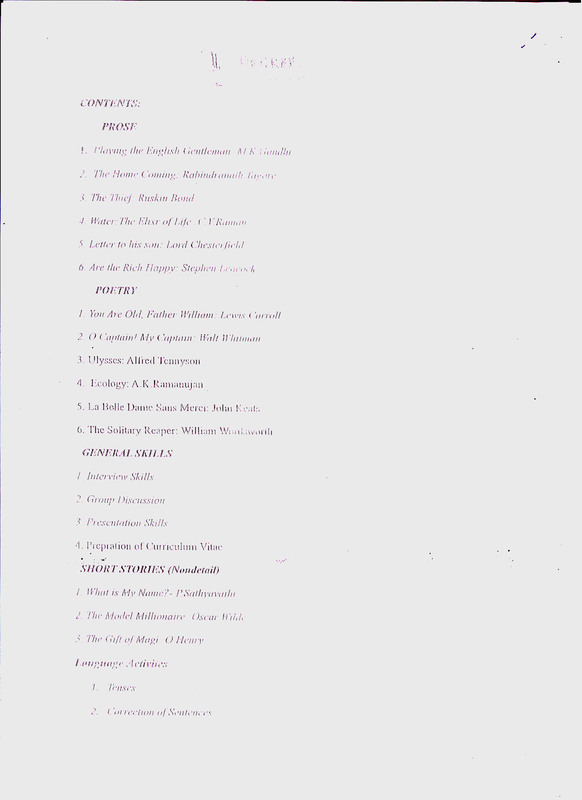 General English Revised CBCS Syllabus. 24/04/2017 :: HINDI 1st , 2nd and 3rd Semester MQPs. 12/07/2017 :: English First Year Second semester and Second Year First Semester MQPs. 12/07/2017 :: Communication and Soft Skills First Year Second semester and Second Year First Semester MQPs. 12/07/2017 :: An Outline of 20th Century Literature V and Glimpses of World Literature MQPs. 25/07/2017 :: Degree Special Telugu MQPs. 3. Revised CBCS Framework BA & BCom (April, 2016). 8. BA History CBCS Revised Syllabus (May-2016). 18/12/2017 :: B.A. 1st year HISTORY MQPs. 18/12/2017 :: B.A. History MQPs. 23/11/2017 :: B.A. History MQPs. 23/11/2017 :: B.A. History and Culture of Andhra Desa (from 12th to 19th century AD) V Semester MQPs. 23/11/2017 :: B.A. Age of Rationalism and Humanism (The World between 15th & 18th Centuries) V Semester MQPs. 29/01/2018 :: B.A. History VI Semester MQPs. 01/02/2018 :: B.A. Commerce - Accountancy - VI Semester MQPs. 01/02/2018 :: B.A. Commerce VI Semester MQPs. 23/11/2017 :: B.A. Economics VI Semester Syllabus. 7. BA Economics Full Syllabus CBCS (April-2016). 23/11/2017 :: B.A. Economics VI Semester Syllabus and MQPs. 23/11/2017 :: B.A. Agricultural-Economics VI Semester MQPs. 21/07/2017 :: BA Rural industrialisation(Paper-V,VI,VII) V Semester and VI Semester MQPs. 07/02/2018 :: MQPs of Economics Subject - General Elective - VII (D) Rural Economics and Social Change and its related Clusters (D1),(D2),(D3). 05/02/2018 :: MQPs of Economics VI Semester. 9. BA Political Science CBCS Revised Syllabus. 02/02/2018 :: BA Political science & Public Admin - VI semester MQPs. 15/07/2017 :: Social Work V Semester and VI Semester MQPs. 01/02/2018 :: Social Work VI Semester MQPs. 01/02/2018 :: B.A. Education VI Semester MQPs. 11. B.A. Special Telugu Syllabus CBCS (April-2016). 01/02/2018 :: B.A. 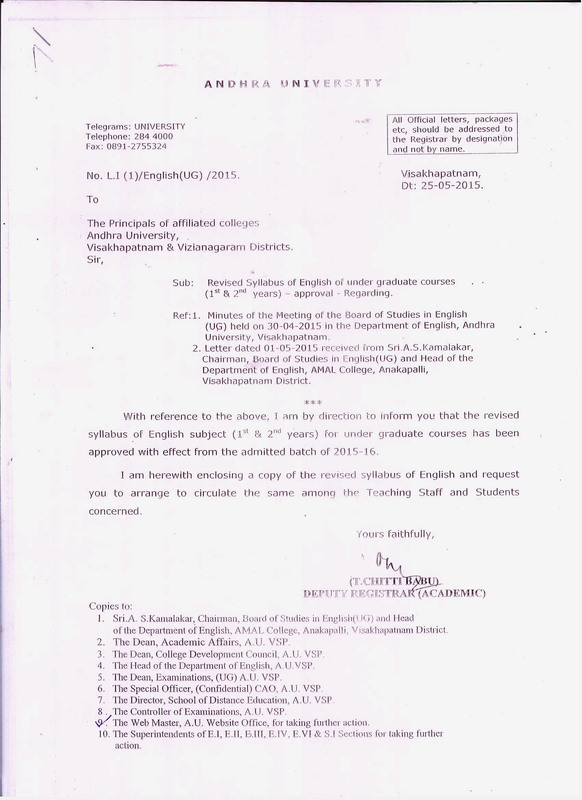 Special Telugu VI Semester MQPs. 12. B.A. Special English Syllabus CBCS (April-2016). 16/08/2017 :: BA Degree V Semester MQPs. 25/07/2017 :: BA Degree VI Semester MQPs. 10/07/2018 :: B.A./ B.Sc. Geography Syllabus 2016. 13. B.Com CBCS Revised syllabus April-2016. 01/08/2016 :: B.Com Computers CBCS Syllabus April-2016. 03/10/2017 :: B.Com. Degree Course - Guidelines for project & Viva-Voce Examination in 5th & 6th Semesters with effect from the admitted batch of 2015-16. 03/10/2017 :: B.Com. 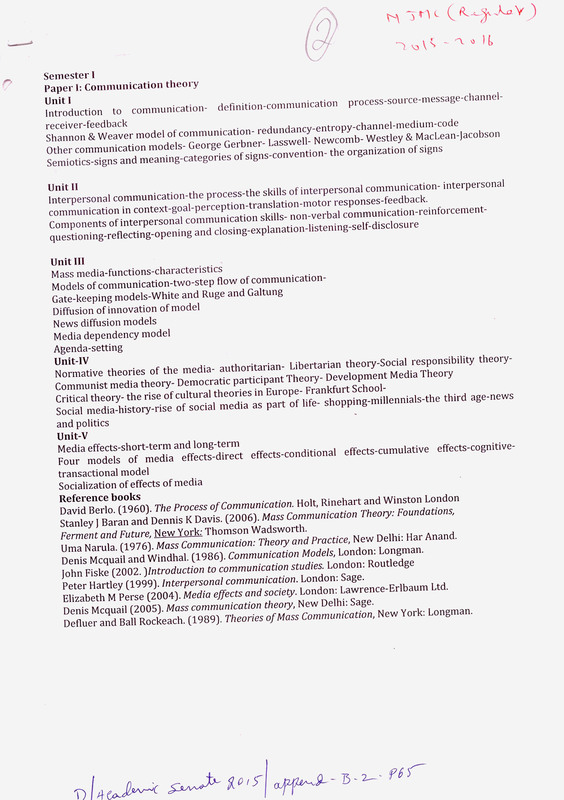 Degree Course - 5th and 6th Semester - Theory Model Paper. 04/01/2019 :: B.Sc. Agriculture Syllabus Under CBCS W.e.f (2015-2016). 25/01/2018 :: III B.Sc. VI Semester Guidelines for Science Courses. 2. Revised CBCS Framework BSc (Revised in April, 2016). 14. BSc Maths CBCS Revised Syllabus (Rev April-2016). 15. BSc Physics CBCS Syllabus April-2016. 16. BSc Comp SCi ,IT CBCS Revised Syllabus (April-2016). 17. BSc Chemistry CBCS Revised Syllabus. 18. BSc Zoology CBCS Revised Syllabus (Rev April-2016). 08/01/2018 :: B.Sc. Botany Syllabus. 08/01/2018 :: B.Sc. Bio-Chemistry Syllabus and MQPs. 19. BSc Electronics I & II Yrs Syllabus CBCS Modified (April-2016). 18/12/2017 :: BSc Electronics MQPs (Ist, IInd, IIIrd, IVth and Vth Semesters). 18/12/2017 :: BSc Electronics VI Semester Syllabus 2017-18. 23/11/2017 :: B.Sc. Geology VI Semester Syllabus. 06/11/2017 :: B.Sc Microbiology Syllabus & MQPs of I to VI semesters along with Clusters. 06/11/2017 :: B.Sc BioTechnology Syllabus & MQPs of I to VI semesters along with Clusters. 04/11/2017 :: B.Sc. Computer Science/Information Technology (IT) revised Syllabus Under CBCS w.e.f.2015-2016 (Modified in April 2016). 24/01/2018 :: B.Sc. Human Genetics Syllabus. 13/12/2018 :: B.SC., BNC (Nutrition) course (VI-Semester)Syllabus. 30/12/2017 :: GUIDELINES FOR BBA 6TH SEMESTER-SURVEY/CASE STUDY. 20. BBA II & III Yrs Syllabus CBCS (Rev April-2016). 03/10/2017 :: B.B.A Degree course - Guidelines for Project & Viva-Voce Examination in 5th Semester with effect from the Admitted batch of 2015-16. 24/08/2017 :: BBA Degree V Semester MQPs. 19/01/2018 :: BBA Degree VI Semester MQPs. BCA Syllabus 2016-17 CBCS Revised. 30/12/2017 :: BCA VI Semester Syllabus and Model Paper for Skill development Course-II. 24/08/2017 :: BCA Degree V Semester MQPs. Subject - PAPER:CORPORATE LEGAL FRAME WORK. MBA CBCS Syllabus and Course Structure 2015-16. 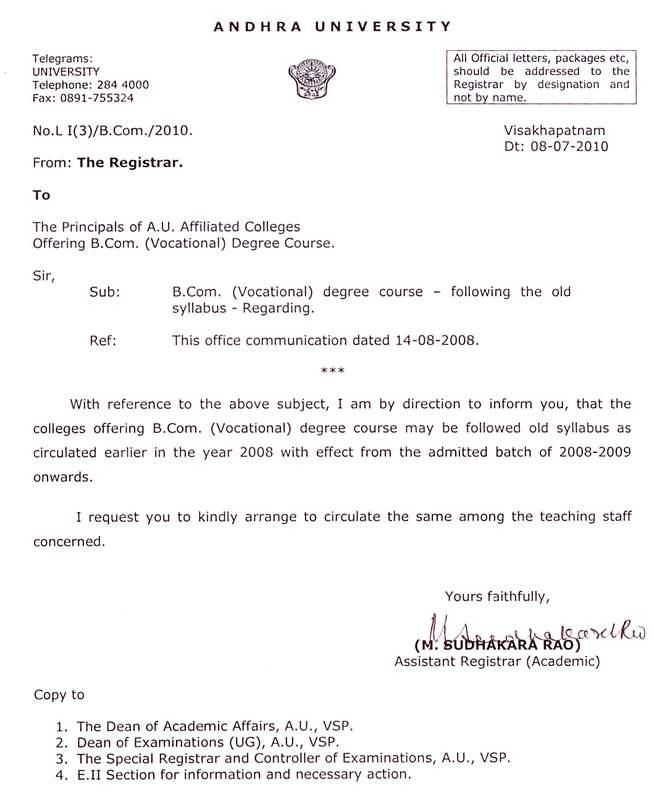 MCom CBCS Syllabus and Course Structure 2015-16. 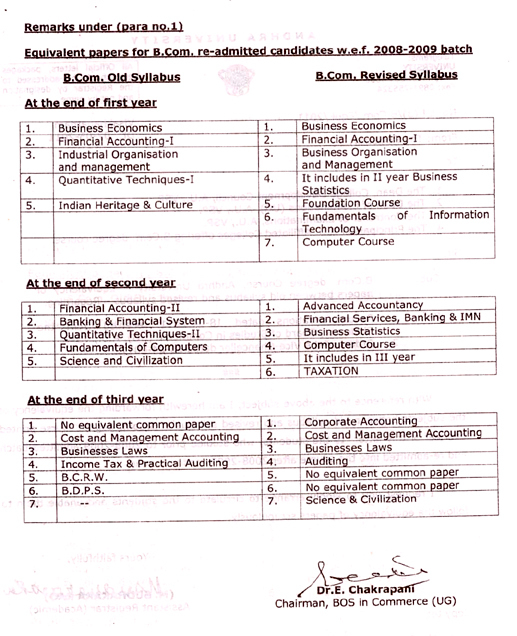 MBA (Banking and Financial Services) CBCS Syllabus and Course Structure 2015-16. MBA (Retail Management) CBCS Syllabus and Course Structure 2015-16. Revised MBA - (FULL-TIME) With effect from 2012 – 2013. MBA - (FULL-TIME & PART-TIME) WITH EFFECT FROM 2009 – 2010. MBA - PART-TIME (FIVE SEMESTERS) WITH EFFECT FROM 2010-11. MFC - FULL-TIME WITH EFFECT FROM 2009 – 2010. MBA (RETAIL MANAGEMENT) WITH EFFECT FROM 2006 - 2007. M.COM. WITH EFFECT FROM 2008 - 2009. M.A. Economis Syllabus and Model Question Paper. M.A. Applied Economis Syllabus and Model Question Paper. Two Years B.Ed. (Special Education) CBCS Syllabus 2015-16. Two Years B.Ed. (General) CBCS Syllabus 2015-2016. M.A. English CBCS Syllabus 2016-17. M.A. English First Semester MQPs 2016-17. M.A. English First Semester Remedial Grammer MQPs 2016-17. || Page-1. || Page-2. M.A. English Second Semester MQPs 2016-17. M.A. English Third Semester MQPs 2016-17. M.A. English Fourth Semester MQPs 2016-17. M.A. English CBCS Syllabus and Model Question papers 2015-16. MFA CBCS Syllsbus 2015 - 2016. M.A. History and Ancient History Syllabus for CBCS (2015-16). 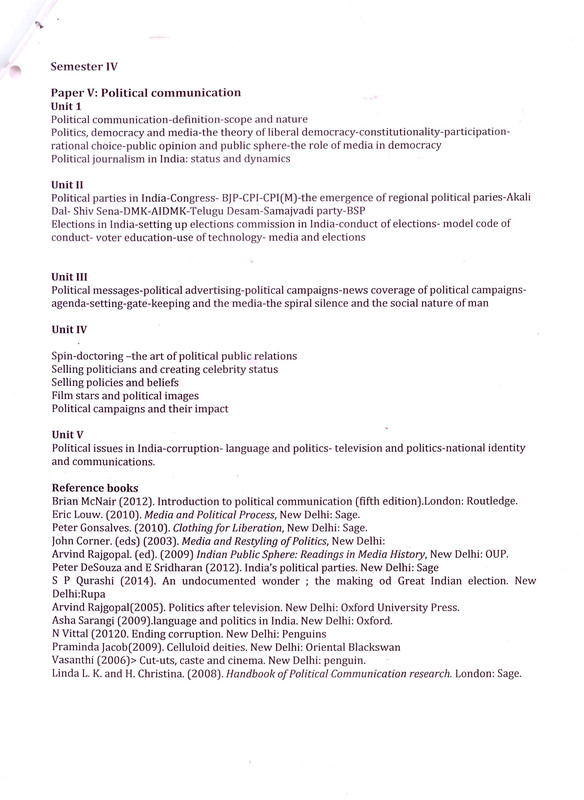 Diploma in Public Relations Syllabus 2015-16. 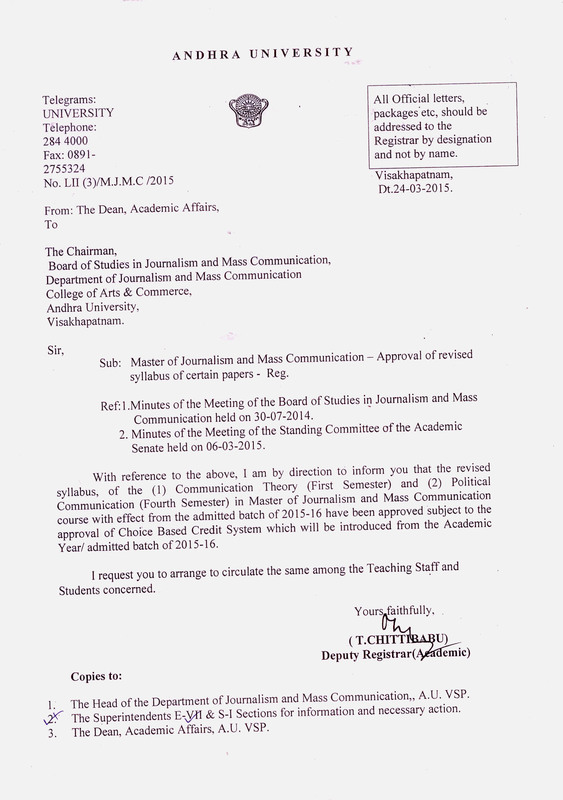 Diploma in Journalim Syllabus 2015-16. MJMC - CBCS Syllabus 2015-16. 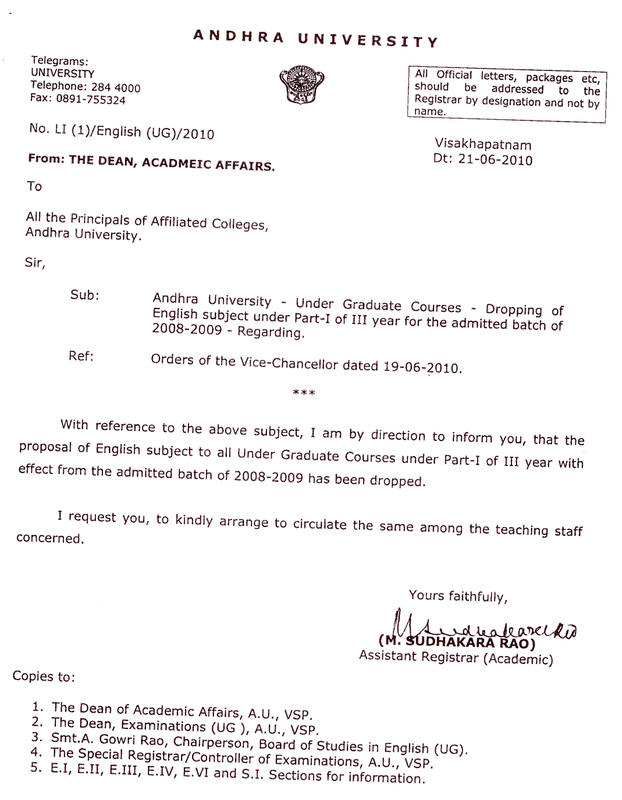 PG Diploma in English Language and Linguistics CBCS Syllabus 2015-16 . M.A. Dance CBCS Syllabus 2017-18. One year Diploma Course in Carnatic Music Sylabus 2017-18. One year Diploma Course in Kuchipudi Nrityam Syllabus 2017-18. One year Diploma Course in Tala Vadyaas (Mridangam, Ghatam & Kanjira) Syllabus 2017-18. M.A. Yoga & Consciousness CBCS Syllabus and MQP (w.e.f. 2016 - 2017). M.A. Women Studies Syllabus 2017-2018. Diploma in Japanese Langugage Syllabus 2015-16. Diploma in Soft Skills Syllabus 2015-16. MSc Horticulture and Landscape Management Syllabus 2017-18. MSc Horticulture and Landscape Management MQPs 2017-18. Geophysics and Marine Geophysics Course Structure 2016-17. M.Sc Marine Geophysics Syllabus of 1st and 2nd Semesters 2016-17. M.Sc (Tech) Geophysics Syllabus of 1st and 2nd Semesters 2016-17. M.Tech Atmospheric Science Syllabus and MQPs 2016-2017. M.Sc. PHYSICS, III & IV SEMESTER. M.Sc. SPACE PHYSICS III & IV SEMESTER. M.Sc Statistics and M.Sc Statistics with Computer Science Syllabus 2016-17. M.Sc Computer Science & Statistics MQPs 2016-2017. Common Syllabus of B.Tech Courses in Engineering, 1st Year 1st Semester 2015-16. B.Tech. (Chemical Engineering) Syllabus 2015-16. B.Tech. (Chemical Engineering) Model Question Papers 2015-16. B.Tech. (Biotechnology) Model Question Papers 2015-16. B.Tech. (Civil Engineering) Syllabus 2015-16. B.Tech (CSE) Syllabus and Schemes 2016-17. MCA Syllabus and Schemes 2016-17. M.Sc. Syllabus and Schemes 2016-17. B.Tech. (EEE) I Year, II Year and III Year Syllabus & Scheme. M.Tech (CSE) & (PSA) Syllabus 2015-16. M.Tech. (EI) Syllabus & Model Question Papers 2015-16. M.Tech. (R & ME) Syllabus 2015-16. M.Tech. (Geo Engineering) Syllabus 2015-16. M.Tech. (Remote Sensing) Syllabus 2015-16. M.Tech. (Nano Technology) Syllabus 2015-16. M.Tech. (Machine Design) Syllabus 2015-16. M.Tech. (CAD/CAM) Syllabus (with effect from 2015-16 academic year). M.Tech. (Industrial Engineering) Syllabus (with effect from 2015-16 academic year). M.Tech. (Heat Transfer in Energy Systems) Syllabus (with effect from 2015-16 academic year). M.Tech. (Thermal Engineering) Syllabus (with effect from 2015-16 academic year). B.Tech. 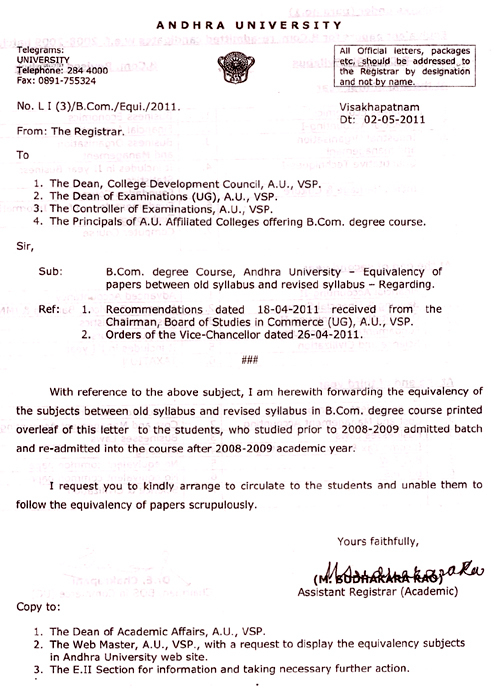 (Four Year Course) & B.Tech. (Six Year Double Degree Course) (With effect from 2015-2016 admitted batches onwards). The subject of Indian Heritage & Culture under part - I(3) syllabus has to be followed in the name of foundation course for 50 marks for the academic year/ admitted batch 2008-2009 only. 05/10/2017 :: PG Course- MCA - Special Drive syllabus. 05/10/2017 :: B.E./B.Tech. and M.Pharmacy Special Drive Syllabus. 05/10/2017 :: UG Course- BSC - Special Drive Syllabus. 05/10/2017 :: UG Course- BCOM - Special Drive Syllabus. 05/10/2017 :: UG Course- BA - Special Drive Syllabus. 08/10/2017 :: M.Sc. Physics Course Syllabus (Special Drive 2017)​​​​​​​​​​​​. 08/10/2017 :: M.Sc. Mathematics Course Syllabus (Special Drive 2017)​​​​​​​​​​​​. 08/10/2017 :: M.Sc. Zoology Course syllabus (Special Drive 2017)​​​​​​​​​​​​. 08/10/2017 :: M.Sc. Microbiology Course Syllabus (Special Drive 2017)​​​​​​​​​​​​. 08/10/2017 :: M.Sc. Chemistry Course Syllabus (Special Drive 2017). 08/10/2017 :: M.Sc. Botany Course Syllabus (Special Drive 2017). 1. New Grading Systems and Examination Rules and Regulations for PG Courses in Arts, Commerce and Management Studies, Science and Technology, Engineering(UG & PG), Pharmaceutical Sciences, 3 & 5 Year LLB, LLM, M.Phil & Ph.D Programmes with effect from the admitted batch of 2015-2016.